Students at NYU confront Chelsea Clinton, claim her condemnation of Ilhan Omar's anti-Semitism to blame for New Zealand mosque massacres. 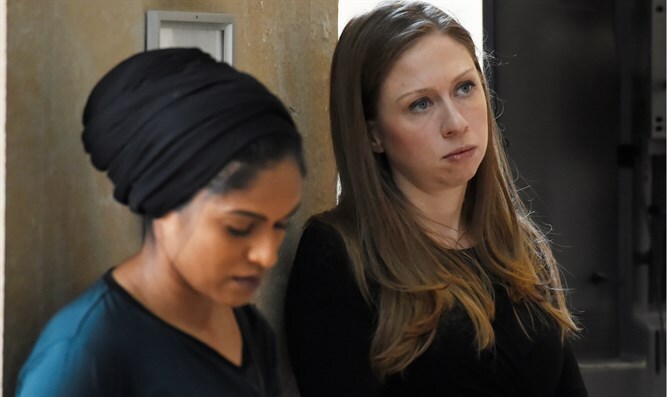 Several students at NYU confronted Chelsea Clinton at a vigil for the 50 Muslims killed in an attack on a pair of New Zealand mosques, accusing her of being a cause of the massacre due to her criticism of an anti-Semitic tweet by New York Rep. Ilhan Omar. The vigil was held at New York University on Friday night. “This right here is the result of a massacre stoked by people like you and the words that you put out into the world,” NYU senior Leen Dweik, who is Muslim, told Clinton at the vigil. The exchange was filmed by NYU senior Rose Asaf, who is Jewish. The students met through the campus chapter of Students for Justice in Palestine, the Washington Post reported. “I’m so sorry that you feel that way, certainly it was never my intention, I do believe words matter,” Clinton responded on the video. Following Omar’s tweet that “It’s all about the Benjamins, baby,” which reinforced the anti-Semitic trope that Jews have money and use it to run the world, Clinton tweeted: “We should expect all elected officials, regardless of party, and all public figures to not traffic in anti-Semitism.” She later thanked Omar for her apology and noted that she looked forward to meeting the congresswoman so that they could talk about both anti-Semitism and Islamophobia. Clinton is not Jewish but her husband, Mark Mezvinsky, is Jewish. She has frequently called out anti-Semitism and other forms of hate. “Chelsea hurt our fight against white supremacy when she stood by the petty weaponizers of antisemitism, showing no regard for Rep. Omar and the hatred being directed at her,” they also wrote. Dweik told the Washington Post that the confrontation was not planned, and that she waited until after the vigil to approach Clinton. Clinton had been invited to the vigil by the Of Many Institute, a multi-faith organization at NYU that she helped found, Clinton’s spokeswoman, Sara Horowitz, told the Post. The Clinton confrontation also was the subject of hundreds of tweets and threats on Twitter. Asaf, who posted the exchange on Twitter, deleted her Twitter account by Saturday afternoon due to threats against her and Dweik, according to the Post.